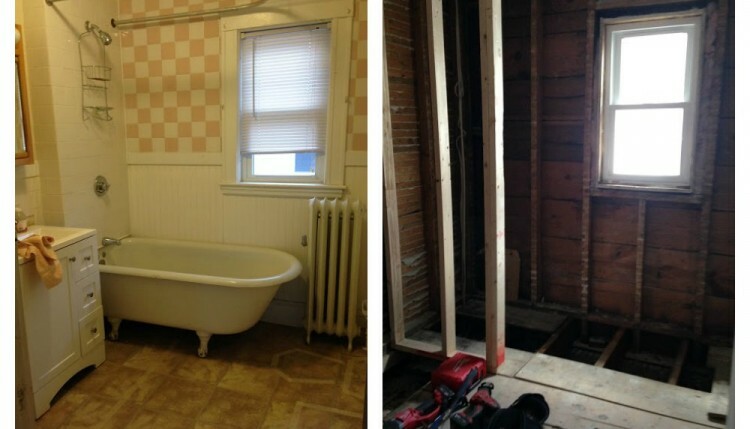 One of the things we really liked about our house when we first saw it was the dated but relatively big (for Boston, anyway) bathroom. It was never nice, and certainly not modern or trendy. In fact, it was kind of dingy in spots. But cheerfully so, if that makes any sense. The pink-and-white checkered tile were one part silly, one part charming. The vinyl stick-on tile wasn’t our favorite — but it wasn’t hurting anybody, either. 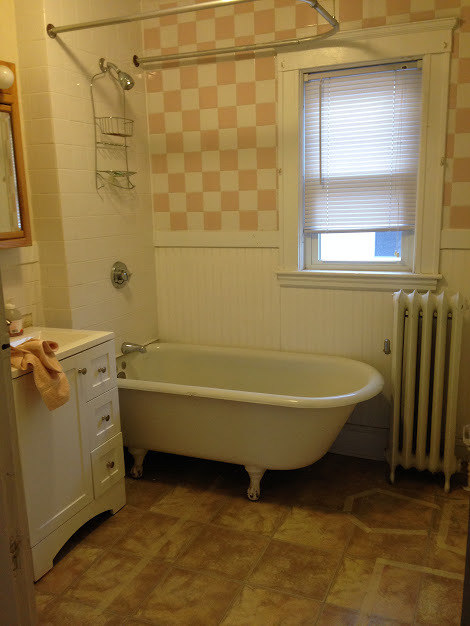 And the beat-up old clawfoot tub added a touch of world-weary sophistication and class. It was like that dotty old aunt who pairs gaudy jewelry and frumpy fashion with a big smile, fantastic stories, and wild laughter. Our original bathroom. We outlined the new layout in masking tape on the floor. But, even beyond its slightly charming datedness, it had its problems. The shower control never worked properly. Much of the tile was installed ungracefully, with smeared caulk and other gunk visible in plenty of spots. And the medicine cabinet was straight out of a budget 1980s facelift. Still, we could live with all that. The reason we finally decided to pull the trigger and gut the whole thing had more to do with our basement than the bathroom. More specifically, the laundry area in our basement. We live on the top floor of a two-family, and our washer and dryer are two stories down in an unfinished basement. We were just plain sick of that commute. And remodeling a bathroom brings a pretty good return on your investment, so we figured we’d kill two birds with one stone: Upgrade the bathroom and carve out room to install a stackable washer and dryer in the apartment while we were at it. There was enough space for our idea to work, but we had to reconfigure the layout to keep things from getting too cramped. 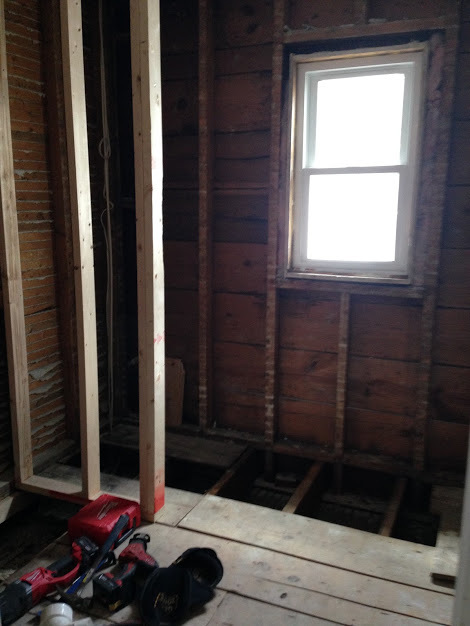 So we’re moving the toilet diagonally across the room — a huge undertaking, I didn’t realize at first, because the drain needs to be pitched and can’t go through crucial floor joists. Our contractor determined that the easiest way to pull this off was to box off a square foot or so from the corner in a downstairs bedroom and run a new drain and vent down through there to the basement. We’re now in the midst of all the action — meaning our house under noisy siege by a constant flow of contractors, subcontractors, and, pretty soon, city inspectors. Amazingly, they’re unfazed by the myriad constraints and problems of our old jalopy of a house. Our plumber says he likes working on old houses like ours because “each one is like a patient” that you need to diagnosis. We’re also knee-deep researching washing machines that will a) fit in the spot and b) will operate quietly without rattling our house too much or disturbing people trying to sleep in the adjacent bedrooms. 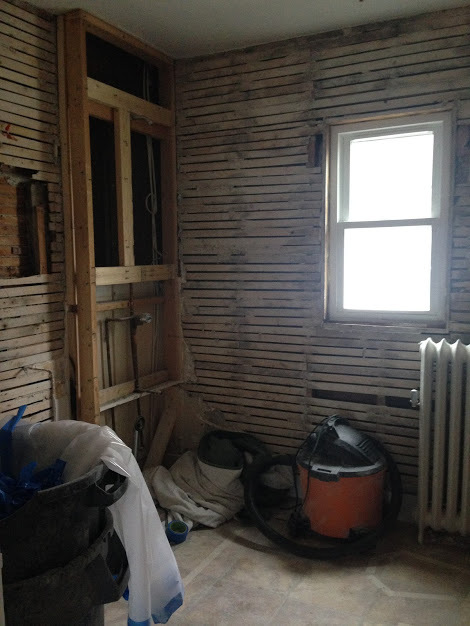 Look for a post diving into washer/dryer combos coming soon — if we don’t get stuck in remodel limbo!